Can You Lose Weight With Intuitive Eating? 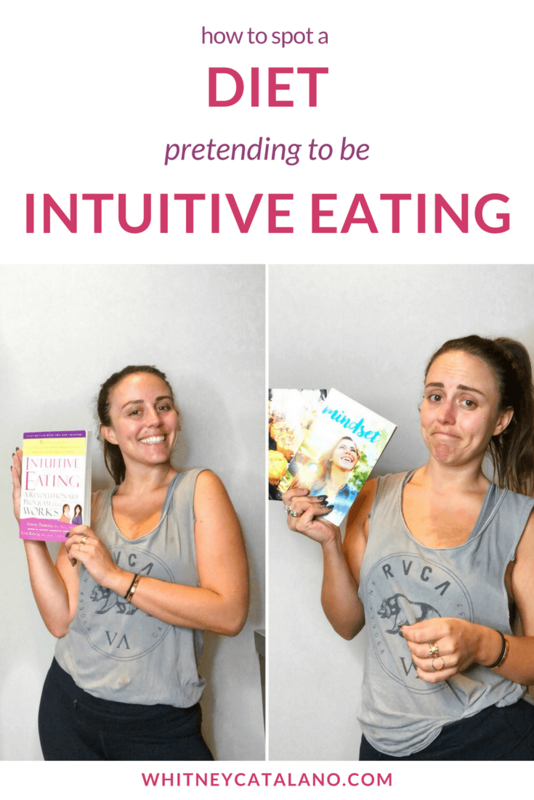 I get the question, “can you lose weight with intuitive eating?” a LOT, I think because of all the confusion around what Intuitive Eating really is. In order to answer this question, I am first going to quickly explain what it is, what it isn’t, and how to spot a fake. Then I’m going to answer this question in 2 parts… 1) do people unintentionally lose weight with intuitive eating? 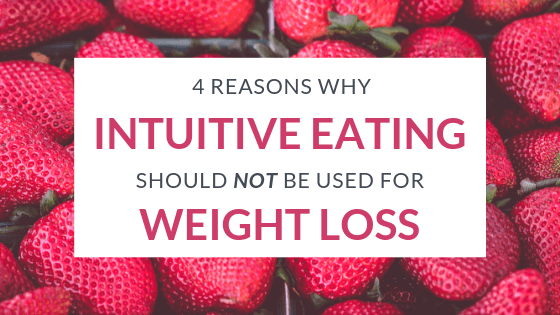 and 2) can you use intuitive eating to intentionally lose weight? 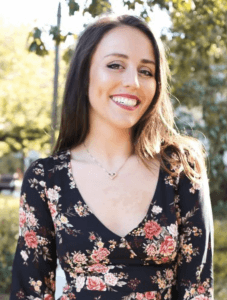 Intuitive eating is a program created by two dietitians (Evelyn Tribole, MS, RD and Elyse Resch, MS, RDN, CEDRD, Fiaedp, FADA, FAND) to help people learn how to eat normally, heal their relationship with food, and pursue health from a weight-neutral approach, meaning that weight loss is NOT the goal. They created this program in the 90’s after years of having clients be unsuccessful in losing weight and disappointed. They looked closely at the weight science and discovered that 95% of all dieters in weight loss studies regain the weight within 3-5 years, have worse health outcomes, and are put at a greater risk for the development of an eating disorder. Anywhere from one-third to two-thirds of dieters regain even more weight than they initially lost and those who do manage to keep the weight loss exhibit what would be classified as disordered eating. After developing the program and extensively studying it, they found that intuitive eaters on average have a lower BMI and better health outcomes than dieters, which in itself shuts down any arguments that you need to lose weight or go on a weight loss diet for health. 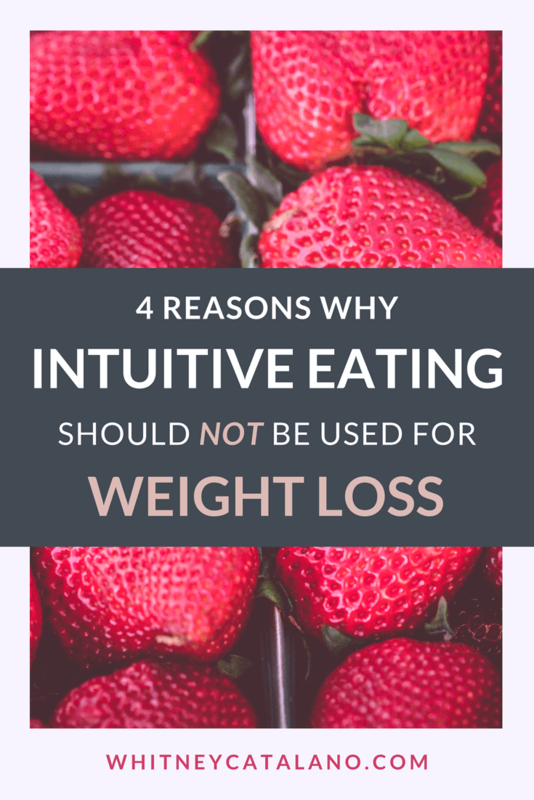 Intuitive eating is NOT a weight loss strategy or plan. Yes, intuitive eaters on average have lower BMI’s than dieters, but that is because intuitive eating does not focus on the pursuit of weight loss (dieting for weight loss is the number one predictor for long-term weight gain). A LOT of companies and influencers who are not trained in intuitive eating (IE) will try to position IE as a weight loss tool, so please be mindful of who you are going to for intuitive eating advice. The quickest way I spot someone who is just using IE to sell you a diet is by checking the article or resource for any mention of weight loss or weight management. Like anyone else, I’ve found myself scrolling Pinterest for IE tips, stumbled on a website, and then halfway through the article, the author will say something like “Intuitive Eating helped me lose weight!” or “incorporate IE into your flexible dieting for better weight loss results!”. Obviously, the wording is not always this clear, but this is a good way to find out if the person you’re looking to for advice is misinformed (and not evidence-based). Yes, people do. But people also gain weight (necessarily) and maintain the same weight with intuitive eating. This is really a conversation about set points. Your set point is a body weight at which you do not need to consistently restrict or binge eat or obsessively exercise to maintain. It’s the weight at which your body will comfortably remain when you establish a normal eating pattern. Normal eating changes from day to day. Some days you’ll eat more, some days you’ll eat less. At points in your life you may find yourself 10 or so pounds heavier, and other times you’ll be 10 or so pounds lighter. Studies have shown that this is a normal change in weight that still hovers around your set point. 1b. If some people do lose weight with intuitive eating, can I start intuitive eating with the hopes of losing weight? I mean, technically yes, but I don’t recommend it. If you’re reading this article or watching my videos, chances are you don’t have the healthiest relationship with food, so I definitely would not recommend going into it with this mindset. 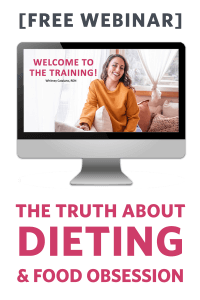 Not only are you putting yourself at risk for turning intuitive eating into a restrictive diet and making your relationship with food more complicated, but you also might not lose weight. You might be one of the people who needs to gain weight. So it’s best to just follow the program as it’s written and abandon weight loss as a goal altogether. 2. Can you use intuitive eating to intentionally lose weight? No, and there are 4 reasons for this. #1 – Intuitive eating is honoring what your body needs. Dieting for weight loss is, by definition, eating less than what you need and ignoring cravings that don’t fit your diet. You are literally intentionally putting yourself into a calorie deficit to make yourself smaller, which is not honoring what your body needs. Even if you do start out wanting the same things as your diet, you’ll eventually have to pick between the two. Like I said before, you’ll also most likely end up making intuitive eating restrictive and disordered. #2 – Let’s talk about the set point theory again. The set point theory is one of the foundational theories behind intuitive eating because the whole program is about eating for your body and trusting that it will settle at a weight at which you don’t have to consistently binge or restrict to maintain. Diets for weight loss are about manipulating your body into a smaller size, which means not trusting your body to settle at a weight that works for you. #3 – In intuitive eating, the first step is rejecting diet culture. I do not believe you can successfully reject diet culture while also participating in diet culture by dieting for weight loss. There just isn’t any room for restriction or diet culture mentality in recovery. I’m not saying that you have to wait until you never want to diet again in order to start intuitive eating because that’s just not realistic. A huge part of the intuitive eating process is learning to let go of this desire and reject the culture that taught us we need to lose weight. What I am saying is that you have to be willing to commit yourself entirely to the process for it to be successful. And that means not participating in diet culture. #4 – I’ll keep this one short because I already reviewed the research above, but Intuitive Eating is a program that has been extensively studied and tested over the years to WORK. It is not a diet and the intention behind intuitive eating is not weight loss. That means that companies and influencers using intuitive eating to sell weight loss are NOT practicing according to evidence, and therefore it’s not really intuitive eating. Be skeptical of anyone promising weight loss while using the phrase intuitive eating. If you are feeling overwhelmed and wondering what you’re supposed to do, here are a couple questions to ask yourself to help you get started. #1 – What are you hoping to gain from weight loss? Is it health? Disease management? Is it approval from others? Love? Acceptance? Happiness in your body? 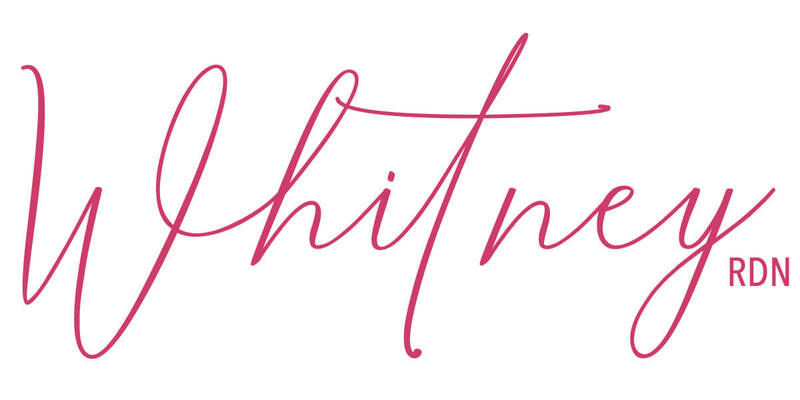 You can’t let go of wanting to lose weight until you understand WHY you want to. I help a ton of people manage diseases like PCOS, hypothyroidism, hashimoto’s, pre-diabetes and diabetes, perimenopause, IBS, etc. WITHOUT weight loss or dieting for weight loss. If your health care provider tells you that weight loss is the only way, they are not practicing ethically (because weight loss is actually not supported by research, as we talked about). #2 – How can you work towards achieving these things without going on a diet (or how can you change your mindset about the things you can’t control)? You may be surprised that many of the things you are looking for from weight loss can actually be solved without weight loss. Check out my YouTube video below and make sure to comment with any questions you have so I can use them to make future videos.